«Midt i blinken» is the slogan of Vestnes municipality in Norway. «Midt i blinken» refers to a geographic placement of Vestnes in the middle of the municipality. 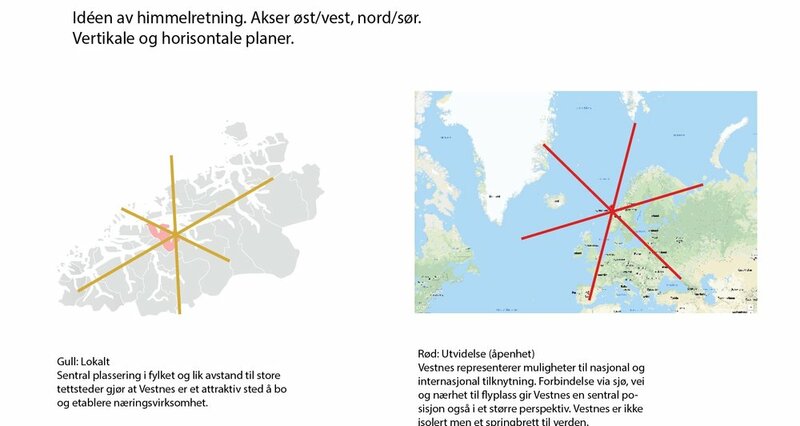 With an equal distance from north and south to two main towns Ålesund and Molde. An advantage to both residents and business. The idea for the logo is focused on care, cooperation and connection. With a use of the triangles and the color red and gold from the municipality coat of arms. Same idea developed to specific areas of work. As per example: culture, care, business, heath. Use of one color per area. Note: I've done this project while employed by Reklamehuset Nord in Hammerfest, Finnmark (2018).